what a week. first things first i suppose. music server – still no joy. the “right” one came back from the techie guys, ostensibly fine and working, but when we opened it, set it up and connected it, it wasn’t ok. no power light, although there was clearly power, you could hear the fan. but it wouldn’t connect, either via the network, or directly. had a long talk with said techie guys, tried more fiddling and faffing about (taking out the hard drives, changing the network leads) but no joy. now we’re in the process of insisting on a refund. Hmph. next thing, also computer related. have been trying to get iTunes to work in Ubuntu. well, what a performance. there are a number of software packages in Ubuntu which will do some of it. I need cover art, ripping, medata editing and syncing. none of them will sync, but one or two of them will do most of the rest. well, that’s no good. i knew about “wine” which is a little package you can use in Ubunto to make Windows packages work. But not iTunes. Same with “playonlinux”, which was new to me, and quite exciting till I discovered it doesn’t like iTunes. but nowhere on my extensive trawl of the internet did anybody mention something absolutely fabulous called “VirtualBox”. It’s free, written by oracle, and amazing. you install it, and then you install Windows x inside it, then you install iTunes inside that. It mostly works – the only stumbling block is ripping, but it works perfectly otherwise. i guess most people download music these days anyway, i certainly do, so i’ll be using that from now on, rather than dual booting. my friend’s extremely techie partner told me, via her, about it. thank goodness there’s somebody to ask now, though don’t want to bother him too much. and me. how am i? well, have been improving day by day but today have needed a tramadol, having managed without for the past three days. but that’s ok i think. am anxious because i’m supposed to have the cast removed next tuesday, and still have no appointment with the hospital. when it does come through, i then have to phone physio and try and get an appointment synced with them so i go to one department, get the cast off, then go to physio. not going to work, is it, they’re going to be fully booked. 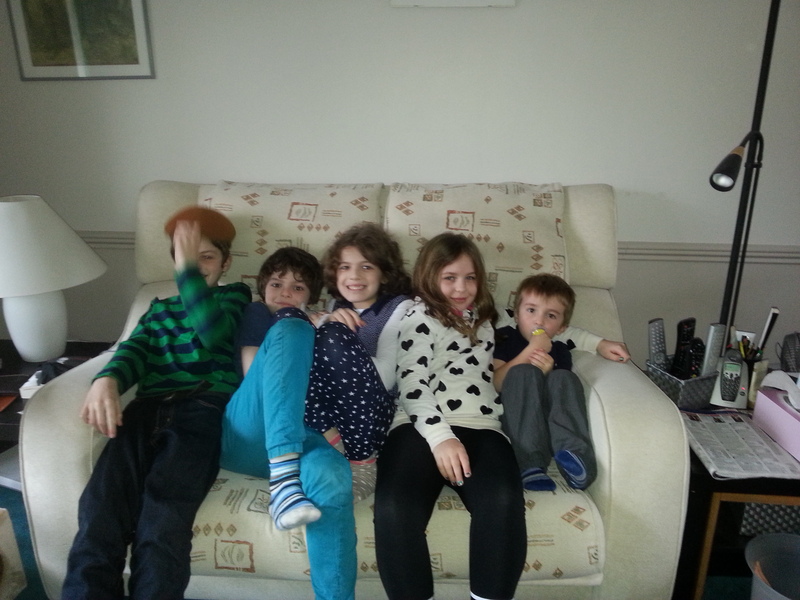 and to finish on a lighter note, we had all five grandchildren to stay last weekend. it was absolutely lovely. they love being together, and played so well, lots of laughing and hugging. loved it. and here are a couple of photos of said weekend! hospital yesterday. they removed the old cast, took out four stitches from the three wounds in my wrist – the big wound in my hand has invisible stitches under the skin. 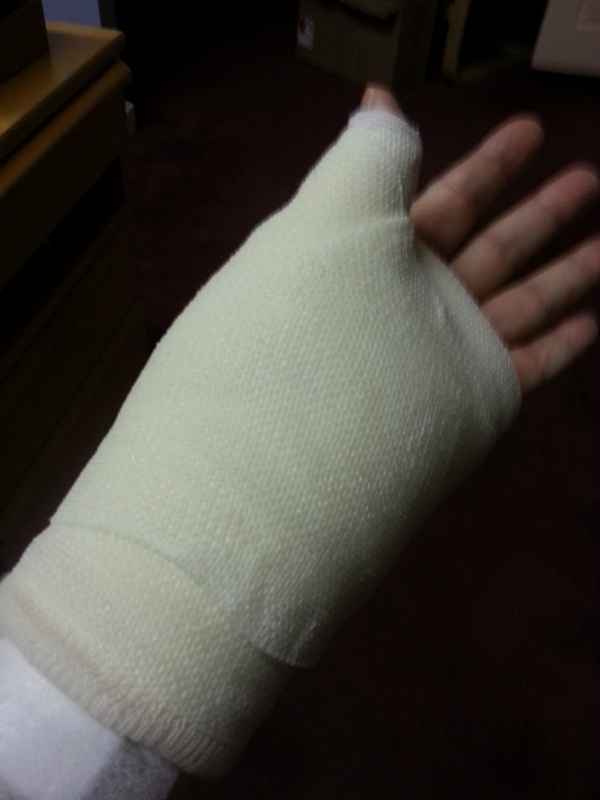 put on a new cast – a thumb spica they called it – which immobilises my thumb. the cast is smaller, lighter, and much harder/firmer than the last one. i was able to wash my hands – oh the bliss – before they removed the stitches and stuff. i was in a lot of pain last night – because they’d been Doing Things to my hand I guess, and today not much better. But i’ve managed to reduce the tramadol to 1 x 4 times a day, which is less than 2 x 3 times a day. still taking the paracetamol though. i seem to have less use in my hand now because the thumb is not moveable. but the strength in my fingers is still gradually improving. i can’t do my own hair mousse though now. two more weeks and they are going to remove the plaster, fix me up with a removable splint, and give me physio exercises to do. but they said yesterday it’ll be a good 3 months before i’m anything like back to normal. you know, they don’t tell you this stuff before the op. only afterwards. must say the care at the hospital is absolutely wonderful. i love the NHS. without it, i’d be in real trouble, physically and financially. thank goodness for it i say. 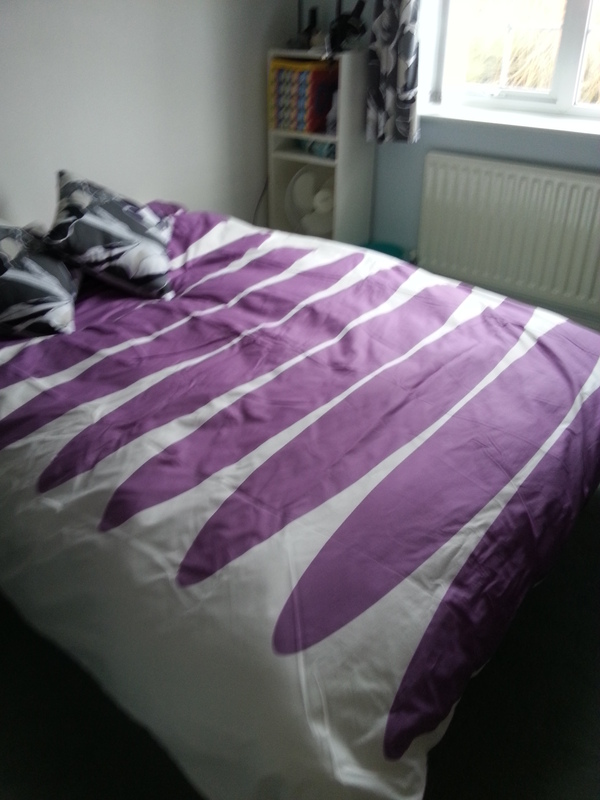 all done – but can’t do capital letters. nine days since the operation.days one and two – awful, no sleep, haze of pain, 2 tramadol 4 times a day. couldn’t use either hand at all. day three slightly better, able to be showered and dressed by wonderful hubby. and that felt better. now, day nine, can type, can dress myself apart from doing up my bra, still need help showering, and am still very tired. when i’ve had a general anaesthetic it takes ages and ages to disperse through my system, so i get waves of aching tiredness. but i’m drinking lots of water. three hours sleep every afternoon. and only taking 2 tramadol 3 times a day. have tried to reduce that but failed. will try again soon. 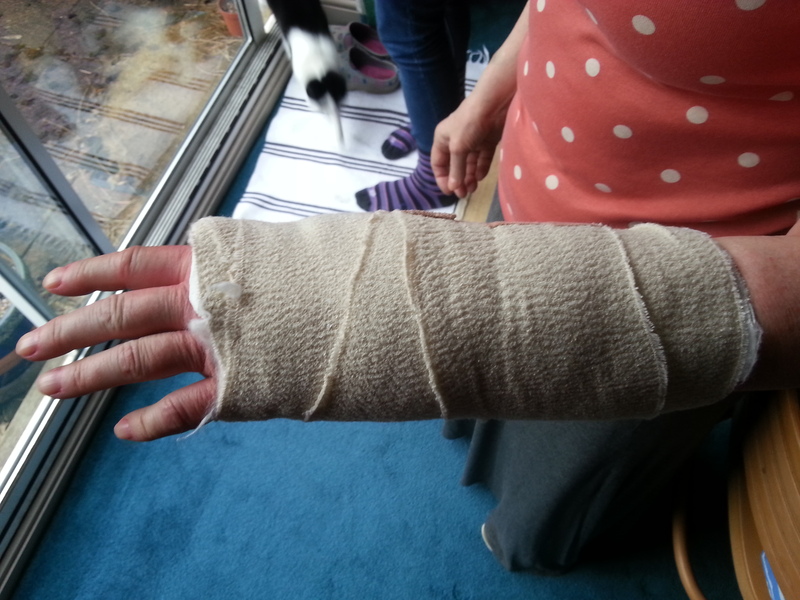 next tuesday hubby is taking me to the hospital – i’m hoping they’ll take the plaster cast off. trouble is, the appointment with the physios, who told me pre-op i needed to see them immediately after that, is not till friday. so the hospital have advised me to go straight round to physio after they take the cast off and see if somebody will see me. meanwhile. i’m actually comfortable in long skirts. have bought several new tops. can only wear short sleeves, though, but that’s ok because i’m always, always boiling hot, and anyway they’ll be nice in the summer. poor hubby though. having to do even more than usual. i always wash up after dinner, because he cooks it. we do have a dishwasher but not everything can go in that – like, say, sharp knives, non-stick stuff, glass saucepan lids, the pressure cooker. he also has to spoon-feed me one of my medicines, as i can’t hold a bottle and pour from it into a teaspoon yet. but there are definite, marked improvements. i can get my own breakfast. i can deal with the cat’s tray – i’m so pleased about that – i can type, read on my kindle, lots more than this time last week. i thought i’d list the things i’ve been doing to stop myself moaning and feel a bit better. monday – eat chocolate.tuesday – eat chocolate. ah well. i haven’t gained any weight, so won’t worry just yet. major major problems with music server – poor hubby is having to manage without his DS for the moment. a DS is like a huge expensive iPod and plays all his music. luckily we have his music backed up because his music server died. and getting a new one which works is turning out to be a major pain in the neck. plans are afoot though. not the best time for me to be faffing about with computer stuff really, but i am feeling better in myself. 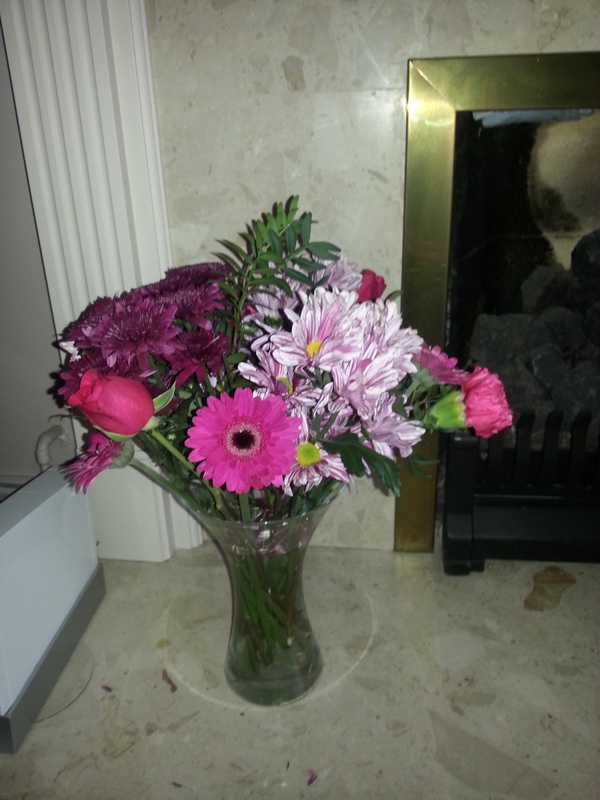 and yd bought me some beautiful flowers last saturday, which, one week later, look just the same. Well. I’m ready, practically speaking. I’ll be in plaster for two weeks +, so I’ve made sure I’m up straight with the ironing. There are six cakes in the freezer, two complete, two in halves, two in slices. Tidied up my desk and done all my filing. Got YD’s birthday present ready, and bought birthday cards for the next three months. Reorganised the shelving slightly in the craft room. Made sure all the full length skirts are the right length, rather than dragging on the ground as I’m so small. In one way I’m excited about having this surgery done because it’s been 27 months now since I started having problems, and I’ve had four steroid injections and one operation (carpal tunnel release) in an effort to sort me out. This should be the thing that works, I hope. But I hate not being independent! I’ve got out both the old-person bathroom aids (a collapsible stool for the shower, and a bench for the bath), and bought a waterproof cover for the arm which will be in plaster (it’s called a Limbo). So as much as is possible I’ve got everything ready. I’ve packed the bag for tomorrow, including two knitting magazines which arrived today. I’m desperate to read them but am saving them for tomorrow. Who knows how long I’ll have to wait before I go into theatre. Am completely off the Tramadol now, with no ill effects. The pain of course is awful, but that will change tomorrow, one way or another. Well, I think that’s probably about it for now. I will blog again as soon as I am able to type.